The owner of 155-meter ship made of steel — Qaboos bin Said. «Business Insider» said that the capital of the Sultan of Oman is almost $ 1.1 billion. The vessel is equipped with a helicopter pad, a concert hall and a cinema. «Al Said» was released in 2007. 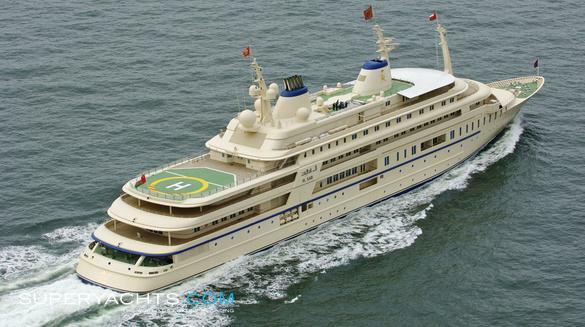 Al Said is a luxurious megayacht belonging to the Sultan of Oman Qaboos. The ship was built under the code name Sunflower. At present, it is the heaviest superyacht in the world with a displacement of 15,850 tons, the most powerful with diesel engines delivering 22,000 hp. And the fourth in the list of the longest motor yachts. Kabus bin Saeed Al Said — Sultan of Oman and governorates. He came to power after the overthrow of his father Said bin Taymur as a result of the palace coup in 1970 and is a descendant of the 14th generation of the founder of the Al Bu Saidi dynasty. Al Said, a motor yacht 155 meters in length, was launched by the Lürssen shipyard in Bremen in September 2007, and at that time became the second longest yacht in the world. The yacht was completed in a few months and delivered to owners in 2008. This magnificent yacht has an exterior designed by Espen Oeino with interior design from Redman Whitely Dixon. Al Said Megayacht with a steel casing and aluminum superstructure is capable of reaching 25 knots, with an operating speed of 22 knots. Layout Al Said offers a luxurious holiday for 70 guests, which will serve up to 154 team members to ensure full relaxation on board the yacht.